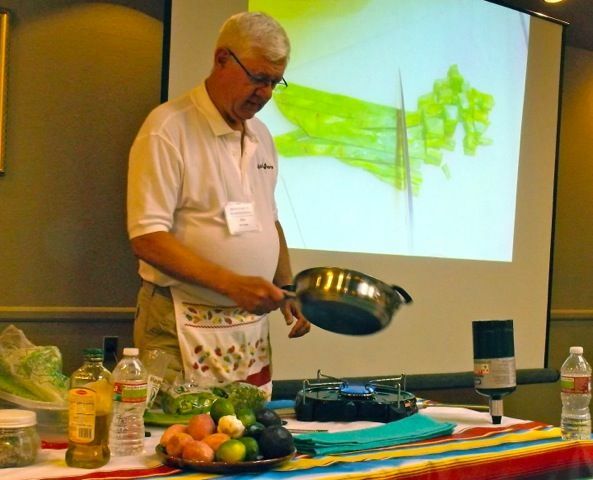 Jim Hastings during a nopalito demonstration. Open puff pastry and set out to thaw according to package instructions. Saute nopalitos in oil until army green and slime has evaporated. Let cool. Stir together cooled nopalitos, green chile and garlic. Unfold puff pastry onto a baking sheet. Moisten seam between sheets and seal together. Trim dough to fit pan, using trimmings to fill sides. Lightly score around perimeter of dough about 1/4 inch. Blend oregano into whipped cream cheese. Spread cheese mixture evenly over dough inside the score line. Spread nopalitos, chile and garliclmixture over cheese. sprinkle red peppers over green chile. Bake at 400 degrees F. for 10-12 minutes until pastry puffs and is golden. Remove from oven and let rest 15 minutes. Then cut into 2-inch squares and enjoy. Here is a photo of some of Jim’s food. You can spot the nopalitos. Sampling of Jim’s nopalito dishes. I was also surprised to find a recipe for Garden Salsa Jam using nopalitos in the June issue of “Better Homes and Gardens.” It was submitted by Jean Groen of Apache Junction, Arizona, a small town south of Phoenix. I couldn’t find it on-line so can’t provide a link. A Google search of Mrs. Groen shows she has a home ec background and has written a book on the edible plants of the Superstition Mountains near Apache Junction. The recipe in the magazine calls for jarred nopalitos, but I’m guessing that was an addition by the editors to make it possible for folks outside the Southwest to try it. When nopalitos, fresh or jarred, make it into “Better Homes and Gardens magazine,” they are well on their way into the mainstream. You can find more recipes for nopalitos in my books The Prickly Pear Cookbook (Rio Nuevo Press) and Cooking the Wild Southwest (University of Arizona Press), as well as complete instructions on how to gather, clean and prepare the cactus stems. 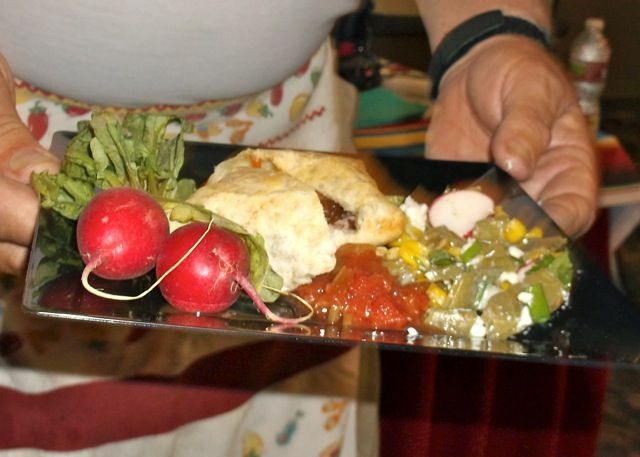 Jean Groen regularly teaches workshops at the Boyce Thompson Arboretum on collecting and cooking with wild desert plants, especially prickly pear and mesquite. I’m sure you’re right that the editors added the jar of napalitos as she always uses the fresh stuff in her classes and demonstrations. YUM!! That recipe may change my life!! Thanks Carolyn, for for expanding my wild foods- culinary world!